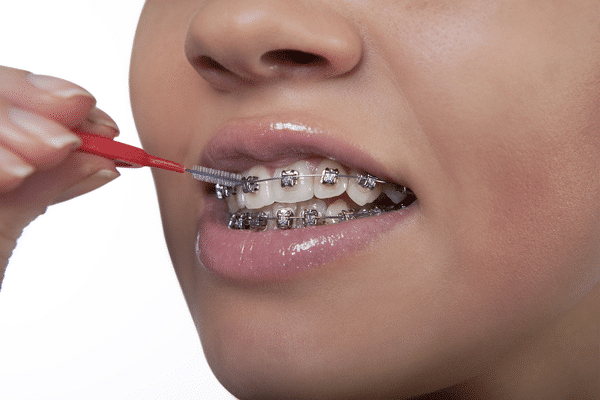 Milestone Orthodontics has recently put on your shiny new braces in Essex County, NJ. Congratulations! You’re one your way to brand new smile. Keeping your teeth clean is more important than ever now that you have braces. Dr. Milestone says food bits have more spots than usual to hide in your mouth, so you must be diligent in order to avoid bad breath, swollen gums, discolored teeth and cavities. If you remove plaque regularly during treatment, you’ll experience better results and shorter treatment time. One tooth at a time! When you brush, take time with each individual tooth – at least 10 seconds each – and pay careful attention to the spots where your teeth touch your braces. It’s all about the angles! Brush the tops of your teeth and braces with your brush angled down toward where they meet. Brush the bottoms of your teeth and braces with your brush angled up. The tooth, the whole tooth, nothing but the tooth! While the front surface of your teeth may seem like the most logical to clean, it’s equally important to clean the inner surface of your teeth (tongue side) as well as the chewing surface. And be sure to clean along your gum line – a key spot for plaque buildup. Step 1: eat, step 2: clean! While you’re in treatment at Milestone Orthodontics, it’s important to brush after every meal. Bits of food can easily get caught between braces and teeth, and these food bits interact with bacteria in your mouth to cause decay. The longer food is in contact with your teeth, the greater opportunity for plaque to form. If you are eating somewhere that you can’t brush, thoroughly rinse your mouth with water. Always be prepared! The easiest way to be sure you can brush after every meal is to get in the habit of taking a toothbrush, toothpaste and floss with you wherever you go. Designate a special container just for your teeth-cleaning tools and keep it in your purse, backpack, or laptop case. Remove the moving parts! If you have elastic bands or headgear, remove these parts before you brush or floss. Fluoride is your friend with or without braces! Fluoride helps prevent cavities. Be sure to brush with fluoride toothpaste, and rinse with fluoride mouthwash. Pointy brushes reach tiny places! Interproximal brushes (sometimes called proxy brushes or interdental brushes) are cone-shaped and come in very handy for reaching spots around your braces that standard brushes can’t. Find the floss for you! Regular floss works for some patients, but others find it easier to work with a floss threader, which helps you get the floss into tight places. Other patients like an all-in-one product called Superfloss, which comes with a stiff end for easy threading, a spongy section for cleaning wide spaces, and regular floss for narrow spaces. Make time for the pros! It’s your job to take care of the everyday cleaning. But make sure to visit your orthodontist and dentist regularly while in treatment, to get the deep, thorough cleaning that only a professional can provide. We hope this helps, and remember to give Dr. Milestone a call at our Essex County office if you have any questions, concerns or would like to schedule an appointment. Contact Milestone Orthodontics today!